The test system under test. Top, from left to right: Switch box, digital multimeter, 500W UPS to run the system independent of AC power. On top is the laptop that runs it all. Not visible in picture is USB to IEEE-488 (GPIB) converter that allows the computer to talk to the test equipment. In the bottom of the cart is the assembled 200V battery pack, with the dummy load above it. The dummy load isn't fully populated with bulbs because until tests are complete with low power there's no point spending money on high power. As shown, the total wattage of the installed bulbs is 1150. 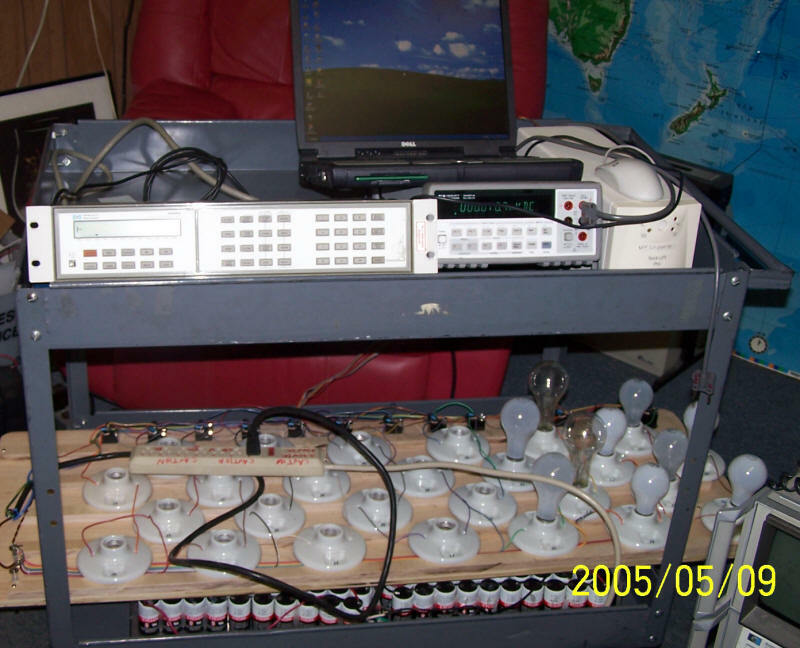 Total capacity of the dummy load, assuming 200W bulbs are installed in all sockets, is 5.6KW (at 230V).